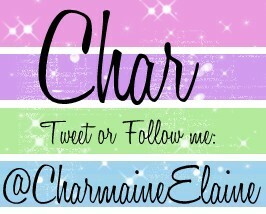 My book blog. I read a bit of everything so therefore I will review a bit of everything. If you like books then you should stop by here and read what I have to say. Also if you're a YA author and are interested in being involved with an Indie August event I'm planning please email me!! I need books to review and give away! I also want some of you lovely people to interview!! A post off me a day keeps the... boredom away! 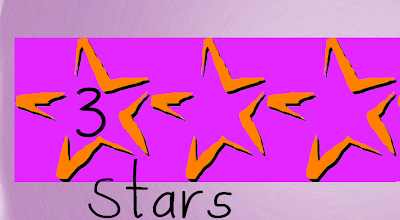 3 stars- It's okay. It didn't capture me in the way I like but overall I enjoyed the book. 4 stars - Good. I enjoyed the book but it lacked something that would have made it special. 5 stars - Amazing. A rating I don't give often but when I do it means the book stands head and shoulders above all others for the same age group. If I've given a book a .5 it means that my indecisiveness has won and I'm stuck between two ratings. Now I've been ill for the past few weeks so my posts have pretty much stopped but with this book being part of a blog tour I've been trying my hardest to read it. However I'm only on page 44 of my PDF copy and I'm due to post so I'm going to try my best to review what I have managed to read. I'm also really sorry that even this post is a bit late. I really am ill. Okay so something I do like is the flow of the story. There's a nice rhythm to it and if I was able to concentrate I have a feeling this is the sort of story I'd devour. It's easy to read Jazmine's POV and I personally think she's quite relateable. I mean we all try to shut off our pain and fail. The fact that I can comment on the flow while I have 0% concentration says a lot about the book in itself. Another thing that I'm really enjoying is that some of the chapters are just Jazmine's diary entries. Books in diary format are something I appreciate a lot. I guess it's because I've always wanted to keep a diary but never managed to consistently write down how I feel. This book has inspired me to give it another go. Maybe I should do that. Jazmine is one of the most interesting main characters I've come across in a while. All that she's been through would leave their scars on any person but Jazmine has to cope with it while having difficulty hearing. While she should technically be difficult to relate to since she's locked away her feelings and is just rediscovering them I can completely get her point. I'm going through something similar myself right now and feeling less alone is always good. The book talks a lot of The Secret Garden now I have a confession, The Secret Garden is one of my all time favourite books. I first read it when I was a kid, my mum always encouraged my love of reading and to this day children's classics are books I really enjoy and this book is reminding me of that so much, that even in my unable to concentrate state, I want to dig it out. I may have to settle for the film though. I'm really enjoying the story and I thought I wasn't taking it in properly but it seems to have stuck in my head. Even though I'm not finished I definitely think that you should all go pick up this book. It won't cost you a penny because it's free so it's not like you'll lose anything if it's not for you. So yes, join me and read this beautiful story. 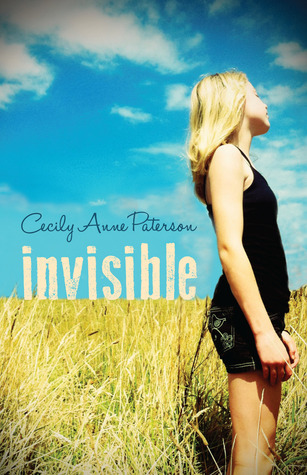 Cecily Anne Paterson is what they call a TCK, or a third culture kid, which basically means she grew up overseas and has some weird issues. Now she’s a mostly normal Australian living in a small town in New South Wales, although her four children don’t wouldn’t necessarily agree with the mostly normal bit. 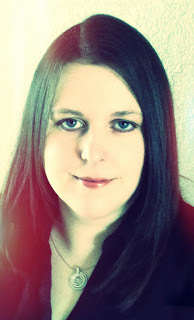 She’s been an editor, a communications officer, an ESL teacher and now a writer. Her ambition is to write two young adult books a year for the next ten years. Elijah is nothing special. He’s just a skinny kid doing his best to stay one step ahead of starvation and the people who would have him locked away in a labour camp - just another Runner. But what he stumbles upon in a forest in Hampshire will show him that the harsh world he knows will become an even more sinister place, unless he can stop it. As past and present and parallel dimensions collide, freedom becomes the last thing on his mind as he is suddenly faced with a battle to save his world from extinction. But before Elijah can find the courage to be the hero the world needs, he must banish his own demons and learn to trust his friends. And all the while, the sinister figure of Maxwell Braithwaite looms, his path inextricably bound to Elijah’s by a long dead physicist, and hell bent on stopping Elijah, whatever the cost. Elijah finally opened his eyes, but lacked the strength to move. Darkness, heavy and insidious, held him. He wasn’t sure if it was night. Perhaps he had gone blind. With this last terrifying thought he began to gulp shallow breaths, desperately trying to swallow the hard knot of panic in his throat. And in the midst of this, from somewhere close by, he gradually became aware of whispering. The conversation faltered. They sounded like young voices, but he couldn’t be sure. 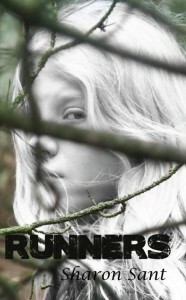 A Runner. The word crashed into Elijah’s consciousness. It hadn’t occurred to him before but, he supposed, that was what he was now. With an almighty effort, his arm responded, propping him up to sit. But even that small exertion had been too much. He leaned over to his side and vomited. Shivering, his head spinning and icy sweat erupting from every pore, he passed out again. "Fireworks" is a short story. After I review Anna Adams' first book, "A French Girl in New York" for her she asked if I'd review "Once Upon A Tag". I said yes but heard nothing back. A few weeks later I received another email off Anaa informing me that "Once Upon A Tag" was going to be free on Amazon if I was still interested. Of course I was and so I got it. I've finally got it and I'm looking forward to reading it. The cover's a grower. I've only just started noticing how nice it actually is to be honest. It's very old fashioned looking yet with an urban twist due to the spray paint and graffiti. The bright colours and classicness of the cover definitely make it stand out once you've really sat back and taken in all of the different elements of the design. Now after a quick search on Amazon, this book is currently retailing at 77p. Which is cheap. It's only a short story so obviously there's no print copy. I got my copy from Amazon during a promotional thing where the book was free, so though the author asked for my review I had to get my own copy so my review will be as untainted as always. 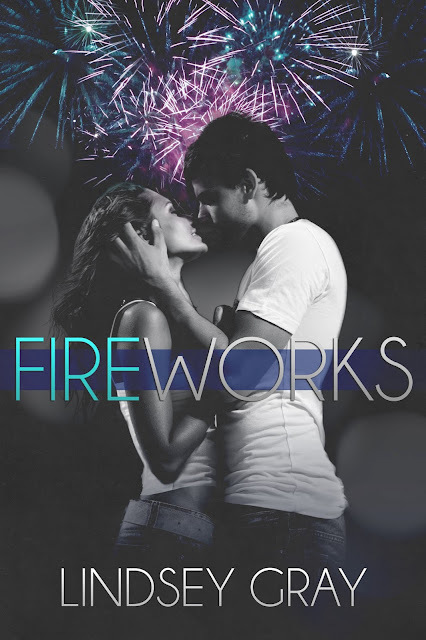 Since this is only a short story this is going to be a mini review. Otherwise we could end up with a review that gives too much away. I found this to be a charming and cute story. 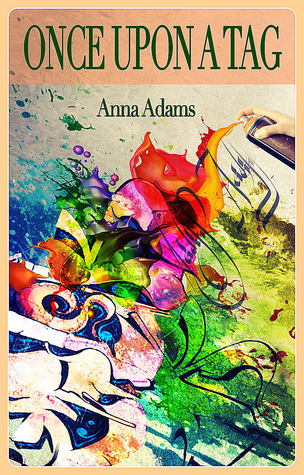 One of the things that I enjoyed most about Anna's full length novel, "A French Girl in New York" was her actual writing style and that's a fact that continues with "Once Upon A Tag". While the length means that it's really quick and easy to read, (no seriously, it's perfect for while you're having a cup of tea and a biscuit) I'm sad that it's so short. I feel that there could be so much more to the story and would've definitely kept reading if it had been longer. David - He's very snotty towards Rita at first and I didn't like that. It just seemed unfair to judge her even though she was doing wrong with the street art and all that. Rita - She's very defensive when David confronts her but I have to say as she works out plans in her head she really warms up. Of the two main characters she was definitely my favourite. I loved how gutsy she was and how vibrant and alive she was. Overall this is definitely a short story I would read again and again. Even though it only took a few minutes to read, I got a snapshot into an underground world in Paris that I want to dream of. I loved the twist at the end of the stories when it came to the characters and thought it was a clever addition to the tale. 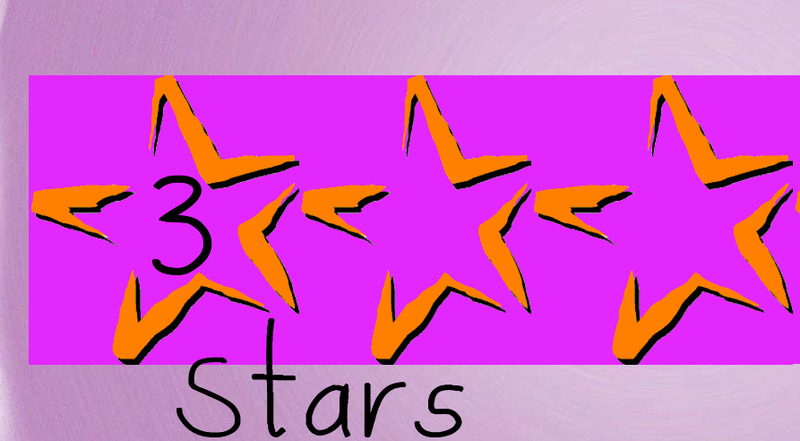 4 stars - charming, cute, but not perfect. I would've liked more. Wanting more is a great achievement for the author but as a reader I felt short changed. I could've grown attached to those characters and the chemistry they were building up. Definitely recommended to those who love YA contemporary tales that don't eat up all you time. So what are you waiting for? It's only 77p!! 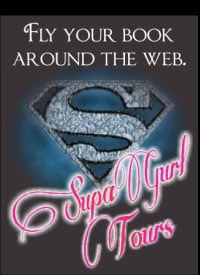 A thrilling adventure hosting an array of heroes and heroines you can’t help but fall in love with. 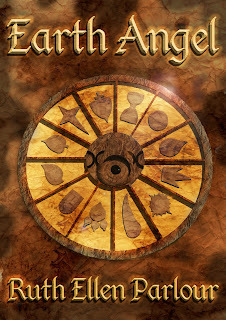 Earth Angel is a high fantasy book aimed at young adults. Eardesha is protected by the twelve Gods and their Earth Angels. Fighting against her destiny as an Earth Angel, Faith is returning to the temple for her lover who she had to leave behind. Gabrielle, a criminal, escapes from prison only to be guided back by the God’s to help Faith stop a war. Threatened by invasion from the Krieger, Eardesha’s military trains convicted criminals into a brutal and disposable army. 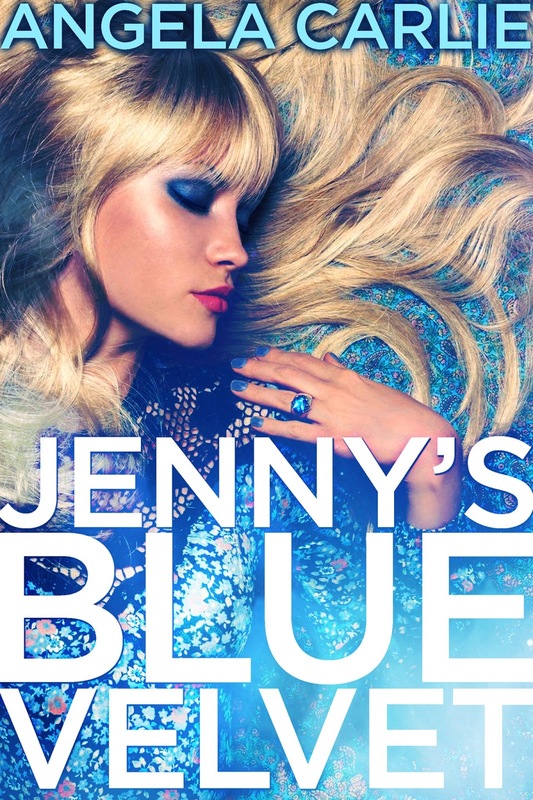 Gabrielle and Faith discover a power the Gods have kept secret for thousands of years, a secret that would change the future of Eardesha, and use it to stop the war. Well simply: The author asked me to. How could I say no? However I can see a typo in the blurb. I hate typos. I get you're an indie author but that should spur you on to be better than traditionally published authors. Who cares if they have more funds to do what they want with? You should aim to make your book just as good. Anyway, slight rant there. I think you can see that it puts me off. However, I said I'd read it and I'll give it a fair chance. Another confusing thing about this is it has 2 names. 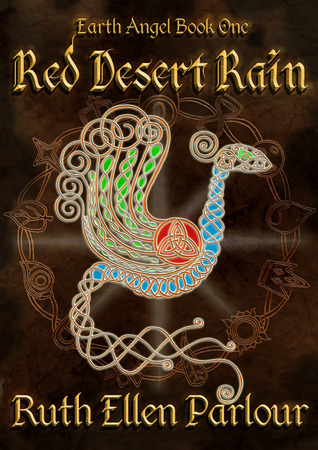 In the email I was told it was called "Earth Angel" but the Smashwords link I received led me to "Red Desert Rain" so I'm reviewing this as what my copy is. Umm... The two different titles have different covers so I'm not entirely sure how to go about this. Shall I say a few words about each? Yes Char, I think that's a good idea. Okay, so now that I've established that let's do this. Earth Angel Cover - Well it's brown. Very brown. Not a colour I'm used to seeing on a book cover. I have many coloured covers but not brown. Not that I can see anyway. 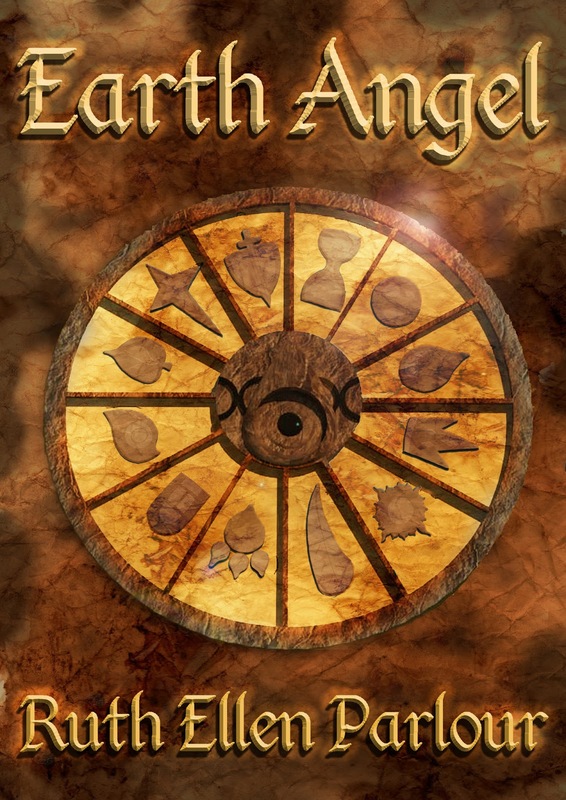 I suppose it works since the title is "Earth Angel" and it has a certain earthiness about it. The focal point is a circle that's in sections and in each section is a shape. While it's an intriguing concept it's not very eye-catching. On a positive note I do love the font. It's very old looking but still clear to read. Overall it's a cover that I'd definitely just walk past if I saw it. 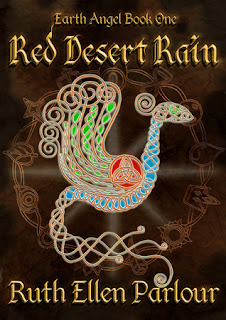 Red Desert Rain Cover - Out of the two covers this is definitely the one that I prefer. It's still brown, but this is a darker shade. Which would normally have me saying the opposite. However the thing I really like is the central focus. It's a sort of weird creature type thing. Meh, but the colours are really pretty and stand out, giving me a reason to actually stop and take notice of what I'm seeing. The title font has changed slightly. I prefer the one used in "Earth Angel", it's more readable. I guess that overall I'm saying that while both covers are very different to what I normally go for. I'm positive that I wouldn't buy either book based on the cover though. Sorry! Okay so this is available on Amazon for 77p. I'm going to let you in on a little secret though. I got my copy for free. Off Smashwords. And Smashwords is better because once you've bought you can use a number of formats. I tend to go for PDF so I can read on my laptop. 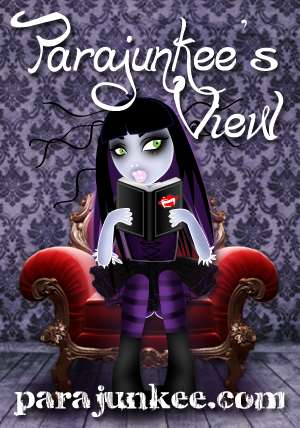 There's no physical version of this though but free on Smashwords so who cares? Despite the descriptive scenes I did have more than a spot of trouble actually immersing myself into the plot. I think it's a mixture of this being a slow burner plot wise (As you all know I tend to like action-packed stories because they pull me in and make me want to join the characters.) and the fact that I did keep noticing little spelling and grammar issues. I saw one word spelt two different ways. Slightly disconcerting to say the least. I do think this would benefit from a quick look over by a professional who could just make the story a bit easier for people to read. As for the pacing, this was told in split POV and the converging of the stories felt slightly weird as the big action sequence was pretty much happening by the time we were fully together and the showdown had been coming about for quite a large portion of the book. As a reader I would've appreciated more background on the history of the hybrids. We'd be given descriptions of lots of different animal/human hybrids yet there wasn't a proper explanation of how they came to be, just a brief "the Gods blessed them while they were in the womb." type thing. That's great and everything but with so much description surrounding other aspects of the book I'd expect the same attention to detail on this. I'm only pointing this out because the idea interested me but I didn't fully understand and I'd really like to. Gabrielle - Now she's the girl our story starts with. 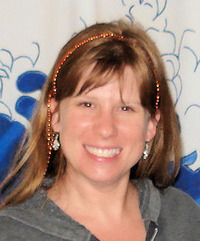 She plays a small but integral role in the story. I can't really comment on her because I saw so little of her. The only reason I'm bringing her up is because I wanted to see more of her. It seems silly to give an inconsequential character such a huge part of the story. Well it does to me anyway. Zenovia - Most of the story follows her. I'm not sure why as she's just to the periphery of most of the action. I think I'd have much preferred if the bulk of the story was from Faith's POV. However back to Zenovia, she's a soppy character and pretty much instantly becomes hung up on a guy she can't have. This annoys me, the story didn't need an almost love story in there. it was irrelevant. I don't want to be on a constant downer though, there is some growth from her but I personally didn't find it to be enough to like her. Emz - Rabbit hybrid, which is part of why I wanted to know more about them. Even though there was a description of Emz I genuinely had a hard time picturing her as anything other than like Bugs Bunny. I don't think that's what the author was going for if I'm completely honest. My main problem with Emz is that she does absolutely nothing to stand up for herself. She allows herself to be defined by her fear and relies way too heavily on her friend Dogga to protect her. I hate the idea of females in books being incapable of doing things for themselves. I don't know how she managed it but I liked her less than I liked Zenovia... and I really wasn't a fan of hers. Overall this is a slow-paced but highly detailed fantasy story. I genuinely appreciate the sheer amount of imagination it must take to put together a story of this genre I don't think it's for me. I really struggled to get into the story properly. I felt detached from the action and that wall is something I don't enjoy having in a story. the final 10% of the book really pulled it back for me and got me excited otherwise this would have been 2.5 stars. I think that if you're into YA fantasy this might be right up your street. Some interesting thoughts and ideas are raised and the description of scenery really is incredible. I just want to thank Ruth Ellen Parlour for asking me to review this and I'm sorry that this wasn't for me. All other images in my posts are mine! ALL MINE!! And if you take them the copyright goblin will eat you. Okay, the Copyright Goblin doesn't exist but be honest, you wish he DID. MWHAHAHA!!! Char has read 14 books toward her goal of 100 books. Series' I'm gonna read this year! Currently reading: (Hopefully) Will Read: < Anyone want to wish me luck?